For some reason you are not following me on twitter or on facebook .. tsk tsk..I posted some info on this whole video fiasco created by Canal + .. while some think the video was a "bad joke" others like myself found it to be in very poor taste & terribly biased & slanderous to one of the best champions tennis has ever seen. Rafael Nadal! The French it seems has nothing better to do then create videos if they would put all their efforts actually training some winning players then slandering one of Spain's greatest competitors & a 10 Grand Slam, humanitarian that actually speaks his mind! .. The Spanish Federation seem to be taken this video to heart ..as they should! But Team Nadal take the high road as always..Rafa is unaffected! can't touch his greatness & that is all that matters to me as a fan! Vamos Rafa! The commitment of Nadal, six time champion of Godo, is the main attraction on the 50th anniversary of the first victory of Manolo Santana, director of the Mutua Madrid Open that will perform a tribute. The center court will increase its capacity RCT Barcelona to beyond the 8,000 spectators. 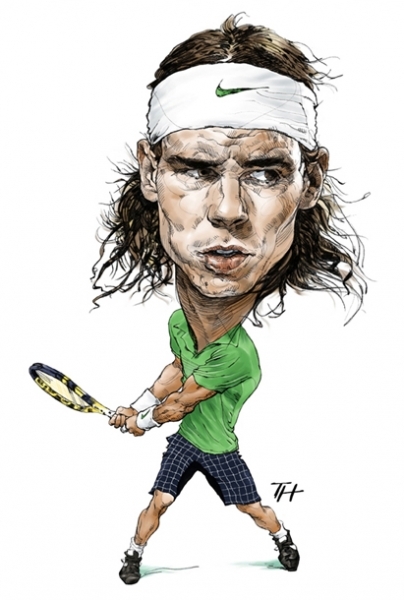 "The French can wait forever (for Rafa to test positive)," he told La Marca. "There is no chance, the chance is zero. If they want to wait they can wait. It’s funny that they mess so much with Rafael and Spanish sport. All elite athletes pass the [doping] control tests, it is impossible to cheat. Rafael had 20 and I think some were a surprise, it is difficult to cheat." "Spanish athletes. They do not win by chance,"
Canal+ officials did not immediately respond to telephone calls seeking comment. "On this occasion intolerable limits have been exceeded and we at the RFET cannot ignore such discredit and slander towards our athletes," federation president Jose Luis Escanuela said. Like all tennis players, Nadal is regularly tested in and out of competition and has a completely clean record. Rafael Nadal is pushing hard for the ATP to change its rankings formula by counting two years' worth of results instead of one, similar to the current golf system. For a while now, Nadal has said the change would lengthen careers by allowing big names to play less often and better protecting injured players. The idea seems to have recently gained more traction. Many other players support the move, says Nadal, and though Roger Federer remains a prominent exception, there's even talk about the issue at an official level. Now here's one more reason for Nadal to like the two-year system: It would mean he'd still be No. 1. This demo looks pretty cool.. I'm def getting this game! Is Victoria Azarenka the female Rafael Nadal? This collection was posted over at PhenomeNADAL facebook page & has spread over to other Rafa fan pages although I have seen better shirtless pics of RAFA .. via BuzzFeed perhaps I should do one of my own? ..maybe! Toni Colom Tweeted this photo of Rafa & a junior!